On Thursday 12th July we held our 1st Online/Helmsman Auction on property at Hardigreen Park Wallabadah.The sale kicked off online with Elite Livestock Auctions on Thursday 5th July and ended on property a week later. We were pleased to sell 12/16 bulls on the day to average $4229 with the top price being Lot 4 HP M50 selling for $9,500 to Gary and Rita Turnbull. We would like to thank all buyers, under bidders and supporters as well as selling agents Landmark Tamworth and Elite Livestock Auctions. Top Price $9,500 HP M50 pictured Moreton Rolfe, Rita and Gary Turnbull and Col Patterson. Thank you to all buyers and under bidders for a successful 2017 sale at Santa Central. We sold 11/14 bulls to average $15,772. Thankyou buyers, underbidders and many repeat clients for your support, we sold 12/12 to average $13,041. 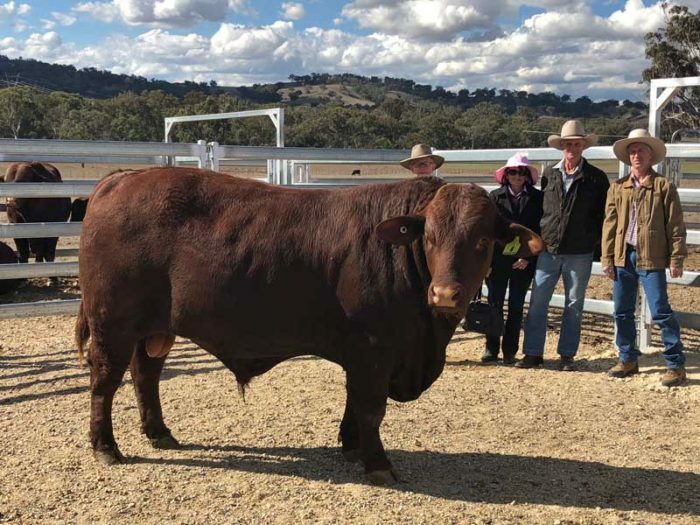 A huge thankyou to all buyers and under bidders for your continued support, we had a 100% clearance, 11 ‘S’ bulls sold to gross $178,000 with an outstanding average of $16,181 and a top of $35,000. Thanks to all buyers and under bidders for your continued support, we averaged $4625 for 8 classified bulls. We sold 16 bulls to average $4,969 and a top of $13,000. On Wednesday 26th September 2012 Hardigreen Park sold 12 Classified Bulls for an outstanding average of $8,833, among the sale team was the top price bull of Santa Central HP Omega F16 (P) selling for $36,000 to Dangarfield Stud Taroom. We would like to thank all buyers and under bidders for their support and wish all our buyers well with their new purchases; Dangarfield Stud, Murgo Stud, Jim Scully, Watasanta Stud, Roger Purtell, Dunlop Stud, Pinaroo Stud, Charlie and Meagan Johnston, Charles Hill, Merty Merty Station and The Winks Family. Hardigreen Park Offered 14 Classified ‘S’ Bulls @ Santa Central Sale 2011 Headingly Sale Complex Clifton QLD on Wednesday 28th September for an average of $7,928, we wish to thank all buyers and underbidders for their support. Hardigreen Park sold 15 ‘S’ Bulls for an impressive average of $9,433. Hardigreen Park offered 14 ‘S’ bulls with a total clearance, and an average of $12,714. Hardigreen Park offered 15 ‘S’ Bulls and 1 Commercial Bull, with a total clearance, a sale topper and an outstanding average of $10,625.